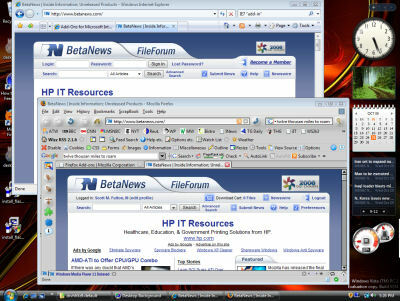 Firefox 2.0 vs. IE7 in Vista: How Close? PERSPECTIVE With Microsoft not having launched a new Web browser since 2001, nor a new service pack since August 2004, Internet Explorer arguably had the longest road to travel to be ready for Windows Vista. Firefox, on the other hand, has had much more frequent point releases, with version 1.5 made available in November 2005. But users have been anticipating major new releases for both brands in time for Vista. IE7, which entered beta in July of last year, struck first, surprising many with a bold and distinct new approach to arranging functionality. The new Microsoft browser would be as different from IE6 as Nissan's 350Z is from the 300ZX. Under the hood, IE was set to change as well, with Microsoft forced to base its new engine upon a different intellectual property base than the ages-old Spyglass Mosaic code. So among those who chose Firefox as a more functional, secure, and adaptable alternative to IE6 in Windows, Microsoft may have helped raise expectations that the Mozilla Organization could deliver something similarly as sweeping. Whatever Firefox 2.0 is, it isn't "sweeping," and nowhere does that fact become more evident than in a Windows Vista test environment. If you ask Mozilla -- and we have -- FF2's principal changes from version 1.5 are these: 1) a cleaned up, well-tweaked user environment; 2) a new integrated spell checker; 3) cleaner handling of RSS feeds, which is one of Firefox' hallmarks; 4) a Session Restore feature, which brings the browser back to the point where it last left off, especially after a crash; and 5) a tab bar that no longer gets cluttered. Firefox first delivered the tab bar, and it's taken IE this long to finally, officially respond. One little secret about Firefox, though, whose relative dirtiness may only be appreciated by enthusiasts, is that a well-used version of Firefox is by definition a well-customized one. Thus a great many things about that well-tweaked user environment, such as the relative positioning of the "Back" button with respect to the "Forward" button (a serious point of contention among FF2 beta testers), will actually be covered over by the user's choice of theme. Most every heavy user of Firefox (and I am as heavy as they come) runs under one of the cooler-looking, more functional themes, my favorite being Johannes Schellen's Modern Pinball. Also, for well over a year, we've had the ability through Firefox add-ons to clean up the tab bar, and endow each tab with its own close box. The on-tab close box is a new feature of FF2, but for many Firefox users, it isn't a new feature. Session restore capability has also been available as a Firefox add-on for well over a year. This is supposed to be one of the good things about community-supported software. But Firefox's official annexing of these features may remind some of the "feature assimilation" tactics that has previously characterized Microsoft, and that may have made it a contender in Web browsing to begin with. Although, that would be an unfair characterization, since Mozilla apparently has no commercial motivation. But with three of Mozilla's major innovations for FF2 having been knocked down, only two star items remain: First, XML pages containing RSS feeds now show up as typeset pages in FF2 rather than as XML source code. This was a must-have feature that first appeared in the earliest IE7 beta last year, and Mozilla could not be seen as behind the times in innovating RSS handling, which has historically been one of Firefox' key advantages. Second is the spell checker, which may indeed come in handy in situations where the browser serves as the front-end provider for distributed applications, which is certainly the case in more and more enterprises. When you put FF2 and IE7 together side-by-side, though, at least today, it's the latter browser that commands the most attention. Microsoft's is the browser with the most to lose, especially with its gamble on a completely renovated usage model. But Firefox's safe bet, by comparison, has garnered some less than flattering results, including one from my friend and colleague, Angela Gunn, who this morning in her USA Today blog called F2 "the most disappointing browser upgrade ever," promising more comments soon. Microsoft Windows users are more acclimated to the realm of commercial marketing, which means that browsers, like brands of detergent and sports cars, eventually become overdue for overhauls, just before they get "refreshed" with a new image and logo. These users' habits are more like consumers - they expect change even when and where change isn't absolutely necessary, almost as though commercial products had "term limits" imposed upon them.